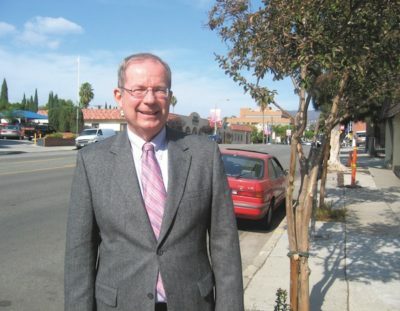 DEACON TOM BRANDLIN in 2008, 42 years after being a student reporter at the Larchmont Chronicle. These days, Tom Brandlin of Park La Brea serves as a not-for-profit consultant at the Soldiers Project in North Hollywood and other agencies, as well as deacon at St. Basil’s Parish on Wilshire Blvd. In 1965, he was a high school sophomore at St. John Vianney High School (in the process of being renamed Daniel Murphy). Like most kids his age, Tom was a veritable wild card of possibilities, but as yet unfocused. Enter intrepid editor and publisher Jane Gilman, who was seeking students interested in reporting on their schools in the Larchmont Chronicle. She contacted Fr. Vincent Cavalli, a teacher at Daniel Murphy, who talked to Tom about the opportunity. That is how Tom became the Chronicle’s first student reporter. As a student reporter, Tom brought in his double-spaced 500-word column every month by deadline. It may have been typed, but this was no hurried email sent off at the last minute or after the deadline. Tom says that was back when the Chronicle offices were on the 400 block of North Larchmont (notice how we’ve moved up from the 400 to the 500 to the 600 block over the years). He would sit by Jane’s desk as she read over his column; they discussed what was happening at school or in the neighborhood. A few times he ended up with independent writing assignments as a result. Two of those articles, one an interview of a USC history professor, and one a report on the work of Marian Bramble and the Crenshaw tutorial program, were published in the July 1966 Larchmont Chronicle. He remained a student reporter at the paper until his graduation in 1968. Tom says that that early training in communicating in a succinct manner has served him well over the years, through high school, university, his master’s in Christian ministry, various jobs with nonprofit agencies, and now as a grant writer and consultant at his business Not-for-Profit Counsel. Tom Brandlin had no idea where his journey would take him when he began as a student reporter in 1965, he says. Currently, there are about 20 student reporters at the Chronicle during each school year. Who knows where they may end up as they begin their own journeys into adulthood?